Many people would have used Clinique staring from their puberty and was into the base cosmetic that made them hard to resist. When the cleansing was first launched I was using it for a while because of the blotches I had on my face. After that I didn’t see any effect so I didn’t used it. 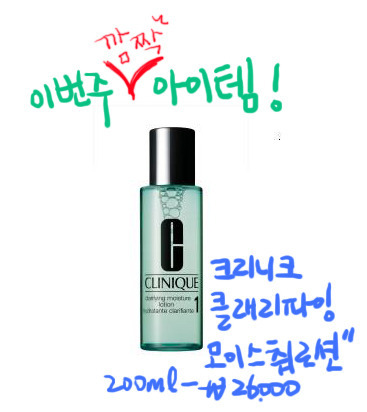 Nowadays there is clarify and clarify moisturizer. The last time I bought is the clarify moisturizer. The picture is number 1 and mine is in pink which is number 3. It says there it is a caring system for keratins. I was leading myself to the Clinique area and bought it. When I was using it for the first time I didn’t really liked it. I didn’t felt as if it was wiping off some wastes. Fist of all before trying this product what about my face ??? My skin type is medium combination. The oil has lessened and in the middle of the cheek there were some keratins coming up. There was no need for me to do scrubbing but I had to do it. After 3days it appears again so I was in confusion. After I tried this product what about my face??? Right away there was no more white keratins. It said to have moisturizing effect but I can’t really feel it. The moisture cream that I use works great so maybe because I couldn’t felt the effect from number 3. I don’t feel any dryness so I think it works in moisturizing. The important is the keratin!. It really removes it and from the day on there were no more keratins. Over a week I didn’t use scrub. Just for incase I bought 200ml and when I am finish with it I will buy 400ml. The price isn’t too expensive so I can use it a lot pouring into the cotton. After using this it is very nice to use a rich moisturizing cream. I have severe keratin problem but I can’t scrub every day. 2-3mintues. Than remove using the cotton buds.